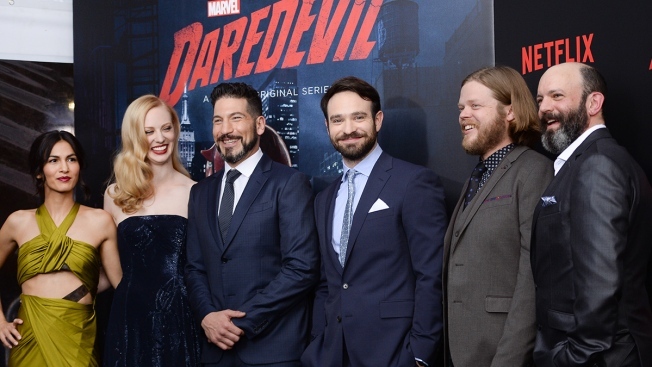 Cast members, from left, Elodie Yung, Deborah Ann Woll, Jon Bernthal, Charlie Cox, Elden Henson and Geoffrey Cantor attend the premiere of Netflix's Original Series Marvel's "Daredevil" Season 2 at AMC Lincoln Square on Thursday, March 10, 2016, in New York. Another one bites the dust. Weeks after Netflix pulled the plug on Marvel's "Iron Fist" and Marvel's "Luke Cage," the streaming platform announced another, decidedly more popular, superhero show won't return: "Daredevil." Starring Charlie Cox as Matt Murdock/Daredevil, the blind lawyer who gained heightened senses following an accident as a child, the series was Netflix's first Marvel show. It helped launch the Marvel Cinematic Universe on TV. With its cancellation, "Jessica Jones," which is currently in production on season three, and "The Punisher" are the only remaining Marvel shows on Netflix. Iron Fist (Finn Jones), Luke Cage (Mike Colter), Jessica Jones (Krysten Ritter) and Daredevil previously crossed over in "The Defenders," a miniseries also starring Sigourney Weaver. But this might not be the last you've seen of horned superhero. The official Twitter account for the show tweeted the below image, note "Justice never stops." And in a statement to Deadline announcing the cancellation, Netflix said the character will be seen again. Will Daredevil appear in another Netflix series? Or does his future lie on Disney+, the new streaming network? And will the same fate befall "Jessica Jones" and "The Punisher?" Could all of Netflix's superheroes eventually make the jump to the new Disney service? See the other shows Netflix has canceled in E! Online's handy guide. Season three of Daredevil dropped Oct. 19, 2018, and also starred Deborah Ann Woll, Elden Henson, Joanne Whalley, Jay Ali, Wilson Bethel, Stephen Rider and Vincent D'Onofrio. Original Post: Daredevil Canceled by Netflix After 3 Seasons—What's Going on Over There?